The Wellesley High School Moving Company holds a Child Lab Dance Workshop. The Wellesley High School Drama Society has had a busy schedule this winter, with several completed projects and numerous productions planned in the coming weeks ahead to fill the long winter nights. Starting off the winter season, students from the Wellesley High School Moving Company, under the direction of Janet Sozio, held a Child Lab Dance Workshop. The annual six-week program is designed to bring dance to the pre-Kindergarten students who attend school at the WHS Child Lab. WHS Moving Company students from Audrey Wang, Kathleen Segal and Jennie Hourican assisted Director Sozio with the instruction of the Rhythm Works curriculum, now in its third year. The workshops gave the Moving Company students experience working with young children and teaching them about the art of dance. ellesley’s talented Acting 4 Intensive students put on the annual One Act Festival. Wellesley’s older performing artists, meanwhile, kicked off the winter performance season with the annual One Act Festival. The festival’s 14 one-act plays served as the culminating projects for Acting 4 Intensive students. Drama teacher Kara Sullivan and technical theater teacher Brian McManimon provided guidance and support to the students. 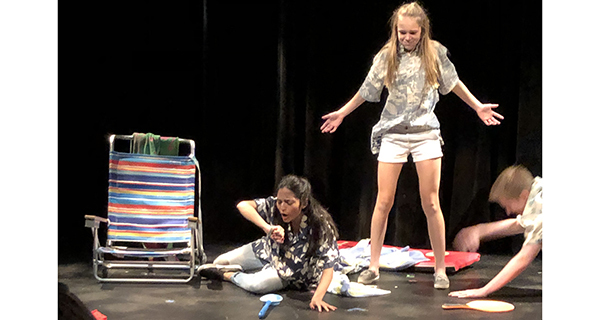 Students in Acting 4 Intensive have taken acting each year in high school, and this annual event gives the budding thespians a chance to get directing experience. The performances combined 12 student-directed one-act plays and two student-written and directed one-act plays, with the pieces judged by four volunteers. Held in the WHS little theater, with minimal sets, props and costumes, student directors relied on the lighting and sound design, created by the technical theater students, to bring the performances to life. The winning performance, “Geniuses” by Abbey Fenbert, will be performed in the Emerson College Drama Festival in the spring. “Geniuses” was directed by Alexa Norton and featured Grace Hone and Caroline Russo, with lighting design by Emma Bowman and sound design by Sophie Laing. The second place winner was “A Fare Ride” by Matt Thompson, directed by Corynne Strollerman, featuring Lili Culhane and AJ Sivapala, with lighting design by Emma Bowman and sound design by Elliot Kovacs. The third place winner was “I Do You Die” by Carrie McCrossen, directed by Sofia Ko, featuring Charlie Kennedy and Caroline Mack, with lighting design by Claire Homa and sound design by Sam Tardif. Now, without a break in the schedule and with the one-acts barely behind them, students and faculty have been preparing for their next production, “By the Water,” a play by Sharyn Rothstein. This production is Director Brian McManimon’s master thesis project, and he is excited to share his vision with audiences. “By the Water” takes place in Staten Island, NY, in the wake of Hurricane Sandy. With compassion and poignant humor, “By the Water” reminds the audience that the very powers that tear apart a community can be a force in bringing together a family. Performances for “By the Water” are scheduled for Thursday, January 24, at 7 p.m., Friday, January 25, at 7 p.m., and Saturday, January 26, at both 2 p.m. and 7 p.m. All performances will be held in the WHS little theater. Tickets will be general admission and can be purchased through the Wellesley High School Performing Arts Department at www.wellesleyps.org. In addition to the winter play, WHS Drama Society will be hosting the Step-Up concerts for band, chorus, and orchestra. The step up concerts are a collaboration between the high school and middle school performing arts departments, providing an opportunity for 8th grade students to perform with high school students and get an idea of what performing at the high school is like. The following performance dates all take place at the WHS Auditorium and are free and open to the public. The band Step-Up concert will be held on Tuesday, January 29, at 7 p.m. The orchestra Step-Up concert is scheduled for Thursday, January 31, at 7 p.m. Finally, the choral Step-Up concert is planned for Thursday, February 7, at 7 p.m.
For further information about the Wellesley Performing Arts Department, visit https://wellesleyps.org/performingarts.